This is a great infused water to make if you have strawberries going bad in your fridge. The chilled water will help prolong the berries’ shelf life while you get to enjoy their sweet flavor! For this recipe, you absolutely must use lemons without rinds. Lemon rinds are quite tart and they will overpower the sweetness of the strawberries. It’s easy to remove the rinds by cutting them away with a sharp knife. You can see a picture tutorial in this blog post. Recipe for an 80 oz Infused Water Pitcher: 1 organic lemon with rind removed + 5 organic strawberries. Slice the fruit and layer intermittently. Combine with purified water and let chill for 4 hours or more. How do you get the color in the water? The pink color is simply from the strawberries. The longer the strawberries infuse, the pinker your water will become (though I don’t recommend infusing for over 24 hours). Hi, i’ve never made infused water before and recently became very interested in these cos i hate drinking water plain, and am not getting nearly enough water as i should be. Wish to ask- can i infuse the fruits, and then perhaps after a few hours, pour the water out into other bottles, then refill with the fruit bottle with more water, repeatedly? Then put the water aside for drinking over a few days? Does the fruit have to stay in the water? I have tried infusing strawberries with water multiple times but I never can drink it because I end up with it full of seeds. What can I do about that? Hmmm. I’ve never had that problem, but I can see how it would be annoying. Can you tell me a little bit about your infusion process? Make sure you use room temp or cold water. Hot water will cause fruits to disintegrate. I believe you are infusing for too long. You should only infuse overnight. I infused overnight and it was fine. However, I left the fruit in my water jug and put more water in it the next day and I noticed the seeds. Also, if you dont like the seeds remaining in your water, use a strainer to pour your water in a different pitcher. Magam Speck: I believe you are infusing for to long. You should only infuse overnight. I infused overnight and it was fine. However, I left the fruit in my water jug and put more water in it the next day and I noticed the seeds. Also, if you dont like the seeds remaining in your water, use a strainer to pur your water in a different pitcher. What does this do? Or what are the benefits? Hydration. That’s the main purpose. While some prefer to drink water as it is, some prefer a bit of sassiness 🙂 Doesn’t really matter if you infuse or not, as long as you get your recommended water consumption of 64 oz a day (8oz x 8). *The plus side of infusing is you’ll get the vitamins and some anti-oxidants unfortunately not the fiber like how you get from making green smoothies. I just wondering what will happen if I infuse strawberry over 24 hours? And what if infusing strawberry over 24 hours in fridge? Can you use frozen strawberries or do they need to be fresh? Um well its better to use fresh strawberries they import more vitamine and they lose them if u freeze them and infuse them! Frozen fruit does not lose vitamins… as long as they are frozen at the peak of freshness, which most are. I would think the problem with frozen strawberries would be the way they tend to fall apart when they defrost. I have never infused fruit and herbs before. I need to drink more water so the tastier I make it the more I will want to drink it. Right? 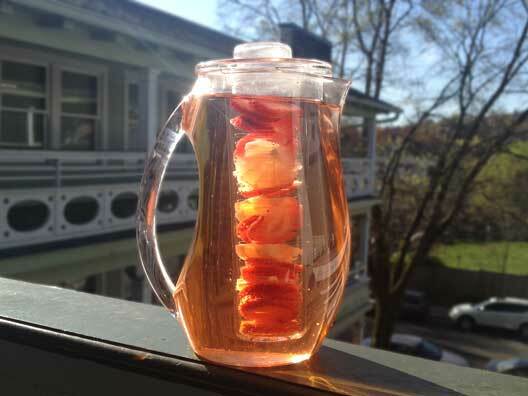 To enhance taste and make it more healthy i add a 0.5cm piece of fresh ginger root to the strawberry water. 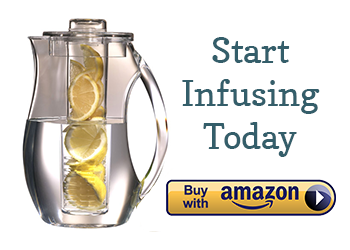 I just started drinking infused water….LOVE IT ! I go simple with just lemon and strawberries. After 3 days I have lost 6 pounds w/ trading infused water instead of soda. I just started drinking infused water….LOVE IT ! I go simple w/ just lemon and strawberries. After 3 days I have lost 6 pounds w/ trading infused water instead of soda.